Video production services for promotion, branding, information, demonstration or training begins with a carefully crafted storyboard to assure that the message is professional, powerful and likely to produce the intended action. Our professional video production is designed to set you apart from competitors and generate quality leads and loyal customers. Build high-converting marketing funnels for sustainable growth. Helps you to build a strong company brand. Provides credibility and positions you as an expert. Builds trusting relationships that grow customers for life. Generates more revenue from new and repeat customers. Introduces new products and services. Provides powerful sales and marketing training tools. Saves money on marketing, advertising and training. Can be used to generate revenue from YouTube advertising. 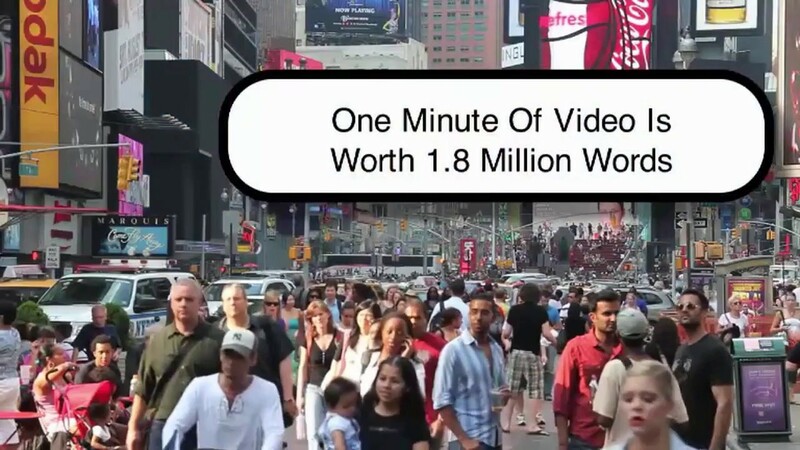 Did you know that one minute of video is worth 1.8 million words? Customers trust websites that have videos and are far more likely to become your customer. Our local business video production services will get you started quickly in harnessing the power of online video. We create customized professional videos that advertise your business and convert traffic into quality leads and customers. But our professional video production doesn’t stop there. We use strategies and software to get your video to rank to the top of search results in YouTube and Google for keywords that your market is searching. Of course, the more video we can rank, the more opportunities you have to convert prospects into leads and customers. Custom and low cost high converting customized video engage your ideal target market, converting viewers into high quality leads and customers. We get your videos to the top of search results where they send targeted traffic to high converting landing pages that maximize your profits. We help you increase your brand, profits and ROI through maximum video exposure that is affordable and works best for your local business. Work with you to define video conversion goals and strategy for each video. With your input, script video with powerful engaging intro and call to action outro. Prepare storyboard plan for video. Integrate your video clips or collaborate with professional videographer for a shoot at your location. Hire professional talent for video productions and voice over narrations when needed. Sequence video clips with voice over, artwork and text overlays, adding animations and transitions between elements. Integrate professional voice over and background music when appropriate. Produce high quality animated video, sketch video or combination. Produce PowerPoint presentations that can be narrated by you or by a professional. Produce screen capture tutorials that can be narrated by you or by a professional. Professional video always begin with a script and storyboard. People respond best to video that is entertaining. This also applies to video for promotion, branding, information, demonstration and training purposes. Video production through a carefully crafted storyboard is the best way to assure that the message is professional, powerful and holds the attention of the viewer. Video for educational purposes can be long or short. Branding and promotional video should be less than 1-2 minutes whenever possible. Professional scripting eliminates wordiness and distracting ums and ahs. It assures delivery of a concise, logical and organized presentation that is persuasive and consistent with the video’s purpose. Interrupts the right target market and gets their attention (the hook). Quickly defines a significant problem or need for your market. Presents challenges with existing solutions. Introduces your company as the one with the best solution (USP). Concludes with a powerful call to action. Video may contain a variety of engaging elements depending upon its purpose. Video can be produced in a variety of formats that might include clips from live recordings, recorded PowerPoint, screen recordings for demonstration, artwork, text messages, animation, sketch video or a combination. These may be produced with background music and/or professional narration voice over. Video intros for branding and outros with a call to action are essential. Animations, overlays and transitions between elements make the video more interesting to viewers. Everyone Wants to Create Viral Video. But the reality is that most viral videos are short, entertaining, emotionally compelling and have massive appeal to a very large market. Viral video is NOT what is needed for local business success. What is important is that your video has great appeal for your local market who is searching keywords and keyword phrases for specific products and services that you provide. The video should closely match their search in getting them what they want or solving a problem they know they have. This may pertain to buying a new home; home improvement or maintenance needs; health and beauty; legal, insurance and financial services; or products and services related to sports, recreation and/or entertainment. Video for local business must be effective and optimized with the appropriate keywords for your region, service and industry. This is how you will make it available to your hot local market who is searching for what you provide. The most effective video is professional, engaging, informative, entertaining, emotionally compelling and short. People have a short attention span and they will lose interest if the video goes on for more than a minute or two. Once you have won them over, longer video with an educational purpose are more appropriate and acceptable. Each video should have a single conversion goal that is aligned with your marketing funnel. Your video can be syndicated via software and strategies that get viewers to become subscribers to your YouTube channel, add their comments and share with their social media contacts. Video can and should also be available from your website and blog, Google Plus Local Business Page, and social media sites like Facebook and Twitter. Google’s AdWords program includes an opportunity to show your video ad to targeted groups within your local area for a fraction of the cost of PPC. Ads display prior to the start of a video that is selected from YouTube search results. If the viewer closes the ad prior to 30 seconds, there is no charge. If they view the full 30 seconds or click the ad, the cost is nominal – well under a dollar. If and when you monetize your channel, advertisers’ ads display prior to the start of your video. We script and storyboard a 30 second video with a single conversion goal that is mutually defined. The video may be your recorded headshot message alone, or your voice in combination with artwork and slides that we prepare with transitions and background music. The effectiveness of your video ad will be determined by the quality of the ad and the quality of the landing page when the visitor clicks. We also prepare quality mobile friendly high converting landing pages to help our clients get the best results from their advertising dollars. Need Video Marketing Services including Video Ranking and YouTube Channel Management? Find out how we can help! Want Affordable, Ready-to-Buy Whiteboard, Animated, and Spokesperson Video that We Customize for Your Local Business?